In 1948, Aldo Leopold, father of conservation wrote: "there are some who can live without wild things, and some who cannot. " Fifty or more years later, many of us agree that wildlife does play an important part in our lives. 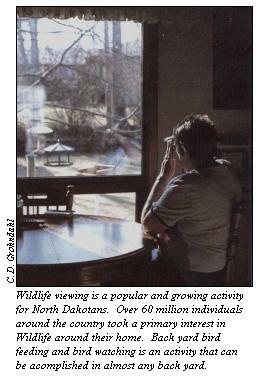 National statistics show that over 60 million Americans feed, photograph or view wildlife. Much of this activity is conducted by individuals living within urban areas. In most of the US, one in every four individuals takes part in feeding, photographing or viewing wildlife. Back yards are one of the most popular and accessible spots for this activity. Since more people are moving into urban areas it may not come as a surprise that landscaping for wildlife and wildlife viewing are becoming more important to urban homeowners. Folks who once lived in rural areas, where wildlife is plentiful, have learned that wildlife viewing in an urban setting can be equally rewarding. Many city folks have become so busy with day to day life that a back yard provides some of the only wildlife-associated recreation available to the family. Landscaping to attract wildlife does more than simply bring wildlife closer to you. By using native plants adapted to living in this climate, you will benefit economically through decreased watering and reduced maintenance. In addition, native trees and shrubs provide visual screens for privacy, help reduce noise and provide windbreaks, all making your yard a more enjoyable place to spend time. Many native plants bear fruits which can be eaten fresh, dried or used in desserts and jellies. The healthy environment created for wildlife means a healthy environment for you and your family. Your back yard can become a classroom to learn how plants and animals interact between species and with one another. Important lessons such as minimizing the use of pesticides and other harmful chemicals can be learned. Reduced maintenance allows more time to spend weekends with family or friends rather than mowing or watering lawns. Landscaping for wildlife is no solution to reducing the enormous tracts of habitat such as native prairie or forests which have been destroyed. However, planned and completed correctly, small areas like your back yard can provide the essentials for many wildlife species, particularly birds and small mammals. Your question about what one person can do to better the environment is answered in your good faith concern for wildlife where it may mean the most to you-- in your own back yard. Presented in the following pages are methods to attract wildlife to your yard. This material is introductory in nature and therefore will be supplemented with references for you to obtain additional information.